Since Family Tree Builder 7.0 has now been officially released, I can talk about the program I have been using for the past few weeks. I was one of the few Beta testers for the new program. I was given a copy of the program and access to the online MyHeritage.com website. I have now used several versions of the program and was very pleasantly surprised at the complete redesign of the program. Previous versions were essentially stand-alone programs and although they were free, they were not so attractive that I would switch to using them exclusively. The only downside of the program from my standpoint is that I am primarily an Apple users and the program runs only on Windows. To avoid switching back and forth with Parallels Desktop, I installed the program on my Windows 8 computer. 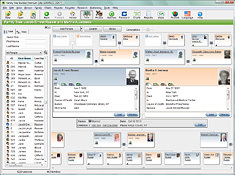 The new Family Tree Builder 7.0 is a significant improvement and places the free program in a position to be a huge contender for market share. From the download site today, it appears that there have already been over 37.5 million downloads of the program in 40 (maybe 37?) languages. I would guess that this moves MyHeritage and Family Tree Builder 7.0 close to the most popular genealogy program in the world. There are several good reasons for this popularity. First the program is visually appealing and relatively easy to learn. But the key here is the fact that the program incorporates both the Smart Matching and Smart Research technologies developed by MyHeritage. For me, the most significant improvement was the synchronization of the program with my online family tree. Through Record Match, I have over 2400 sources waiting to be verified and incorporated in my database. With the new program, the suggested sources are prominently visible on the each of the individuals in the main view screen, so adding those sources to your database is a more efficient process. We've been working hard for more than a year to enhance Family Tree Builder to make documenting and sharing your family history even easier. We're taken the time to ensure this release is as robust as possible and have just completed a successful two-month beta program with some of our power users. Enthusiastic feedback from the first users to use version 7.0 indicates that this is the best version we've ever released. For more features of the new program, go to the MyHeritage.com website. Hi - I also use the program on Windows 8. It is a great program and I have used it for several years. However, I now exoerience peoblems under Windows 8. The program is more unstable (crash every now and then) and after updating to Windows 8.1 - the formatting of text in the Notes section has stopped working (get error message and text is displayed unformatted). Do you have similar experiences? Family Tree Builder 6.0 did allow photos in the family reports, while Family Tree Builder 7.0 freeware doesn't allow photos in family reports anymore, which I feel, is a serious drawback. I have had My Heritage program for several years and find it to very reliable. As I became more experienced I decided to start a second tree based on a long held tradition that the family had a direct lineage to an English family. I was able to create the English family tree from online sources. I then made the tree available on My Heritage in the hope that I would get Smart Matches which would prove the connection. I have got matches that have established an indirect line to the English family and I am now satisfied that there is no direct connection. My main reason for writing this comment is to find out if other subscribers have or did have the problem I encounter. The English family have a lineage back to the early 1400's and I now get Smart Matches which show that current members of my family are classified as children of the English family that lived in the 1500's. The information is so inaccurate that in one case 2 female members of the English family are classified as the mother and FATHER of my family. I sent details to MY heritage through their help connection last July and while I received an acknowledgement which stated they had a 'bug' which they were working on, I have not had a resolution so far. In January 2014 I again sent information but still have to receive a reply. I now believe that I should write direct to the Chief Executive to have my problem resolved but before I do I would like to know if other members have seen or heard of this problem? If you KNOW who the CEO is and have a contact for him-- get onto it. Myheritage are slow to react to users "feedback" but are apt to take directions from the Boss. Gilad Japhet is a strong leader and he would, i am sure, see that your feedback has valuie. The programme is unstable and doesn't handle large trees. All the main features have to be paid for through subscription but it is cheaper to use Ancestry in my experience. The support is poor (really poor) and the reason I post anonymously is that MyHeritage actively removes any criticism of the product or their service from the member forums and doesn't like negative reviews being published online. I'm not renewing my subscription and will be working with another programme which is proving to be everything and more that I need and it is free.....GRAMPS. It's a long job re doing all the media transfers but the programme is constantly updated and I find it gives me all the features and control I need. I don't want smartmatching rubbish and record searching. I do my research the old fashioned way....checking archives, online databases and BMD sources...give Gramps a try.You will be pleasantly surprised I think. I am sure that you noticed that this post is two years old. I would also point out the Family Tree Builder is one the highest rated genealogy database programs by users.